Learning Tree is proud to offer the following Oracle Specialist & Expert Certifications, so you can validate your Oracle skills. 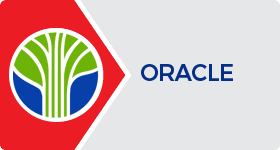 As a Certified Specialist in Oracle 12c Application Development, you have the knowledge and skills needed to take advantage of Oracle Database 12c features for developing robust and scalable databases. You write efficient data manipulation statements using SQL Developer, develop PL/SQL programs to access Oracle databases and select the most efficient solution to complex SQL problems. As a Certified Specialist in Oracle 12c Database Design, you will design your database to model your business requirements, normalize and denormalize data to optimize performance, and automatically generate database documentation using CASE tools. As a Certified Specialist in Oracle 12c DBA, you possess the skills to create, configure and maintain Oracle 12c databases. You will build robust applications, ensure security by managing user privileges and roles and implement automated backup and recovery techniques with RMAN and OEM. As a Certified Expert in Oracle 12c DBA, you have demonstrated the ability to create, configure, back up, recover and provide disaster recovery for Oracle 12c databases. You have the expertise to manage memory and storage, deploy essential procedures and write complex queries.